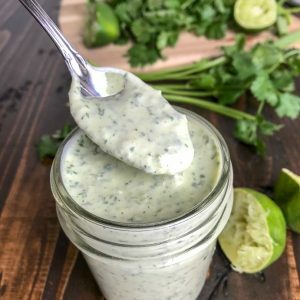 Creamy Cilantro Lime Sauce – the perfect sauce/dressing for any occasion. Easy to make, full of flavor, and pairs well with just about any dish. Can be made within a few minutes using one appliance and became a hit with my Yogurt Marinated Fajita Lime Chicken Kebabs recipe! 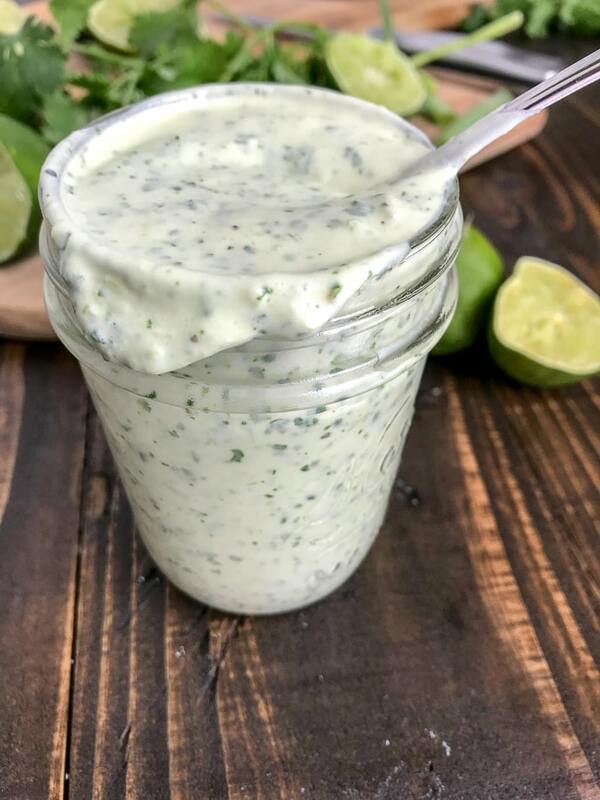 This sauce became very popular when combined with a recent recipe of mine: Yogurt Marinated Fajita Lime Chicken Kebabs! And for good reason – it is bomb diggity! Whether you make this with the kebabs or simply to have on hand, you will have plenty of sauce to go around. If you are a sauce/dip lover who likes to use them for all sorts of concoctions (like me! ), then you are going to love this recipe! Not just for how simple and super quick it is to make, but for how versatile it is. Since the recipes creation, I have made this sauce several times to have on hand. 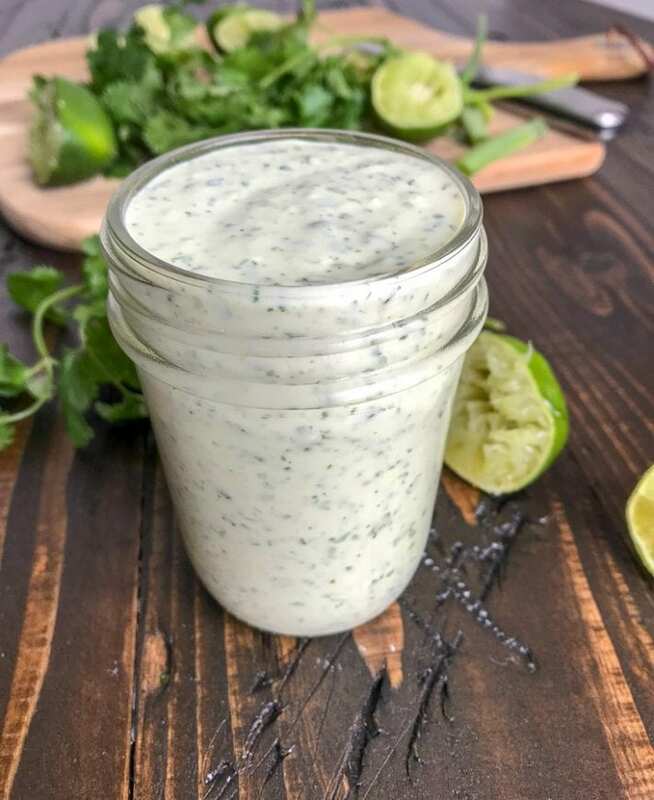 Much like my Creamy Cauliflower Alfredo Sauce recipe, I love to have this sauce in my fridge to spice up the sometimes boring chicken and vegetables dishes. You know, the days when you’re trying to be good, stay away from the wine, but you’re simply not feeling the healthy aspect? 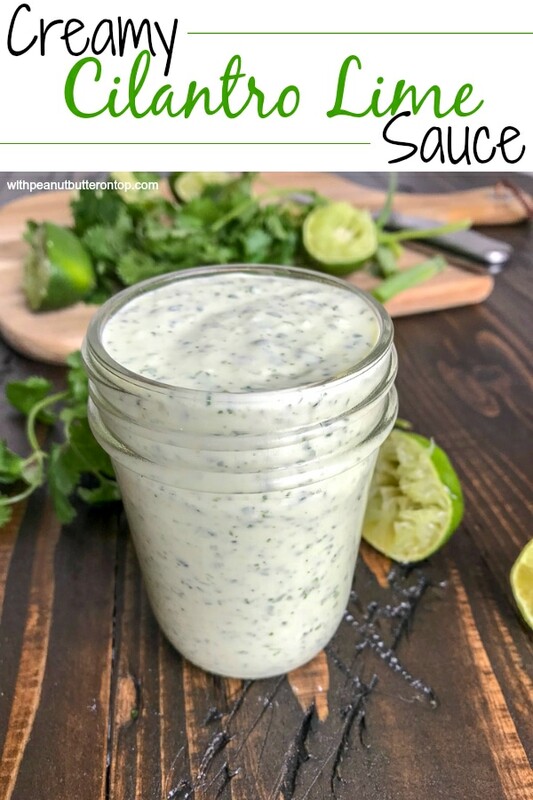 Toss a little of this sauce or the Creamy Cauliflower Alfredo Sauce overtop your dish to add some extra flavor when you need it! 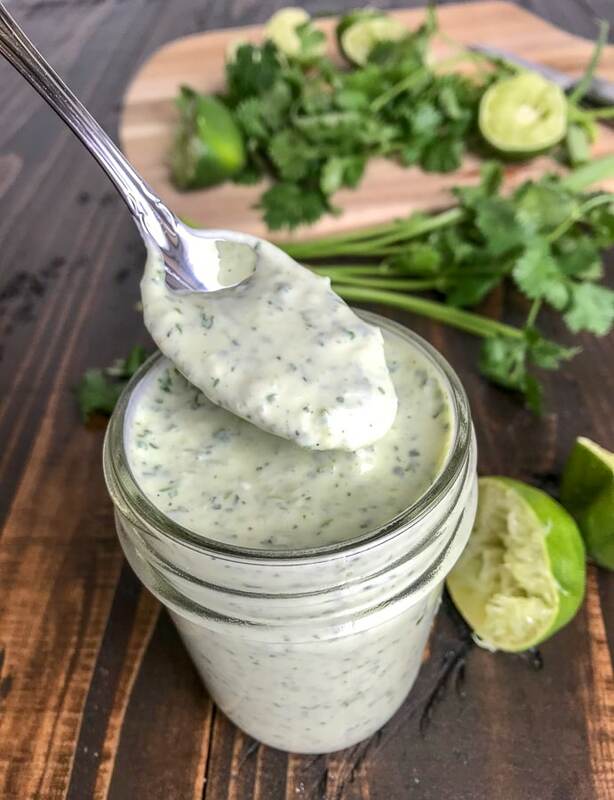 This Creamy Cilantro Lime Sauce also works well with chicken and rice dishes, tacos, overtop salads, as a dip for raw vegetables, and even a delicious burger sauce! 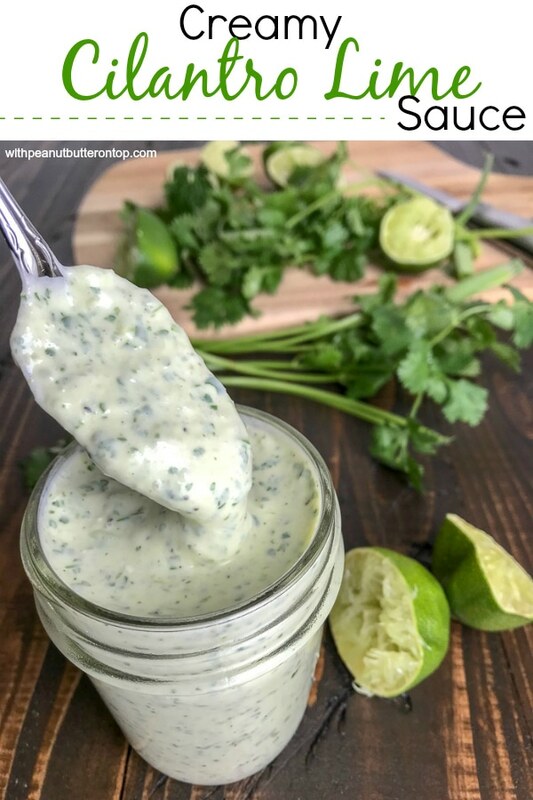 Did I mention that you can also add avocado to this sauce for extra creaminess and flavor?? YEP! Simply toss the avocado (minus the peel and pit 😉 ) into the food processor with the other ingredients and process. You are more than welcome to use low-fat or fat-free cream cheese, but I do not recommend it. The fat from the cream cheese really helps to give this sauce/dressing its flavor. Store in an airtight jar, such as a mason jar or dressing jar, in the refrigerator once processed or when not using. Will keep for 7-10 days. Cashew milk is used in this recipe, but can be substituted for milk of choice or even half and half. 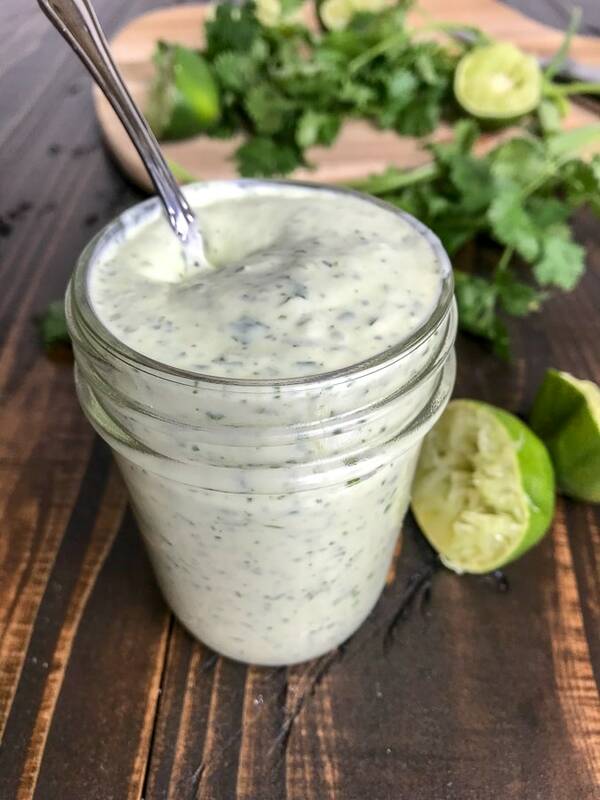 A quick, easy, and delicious sauce or dressing that pairs well with just about anything; chicken and veggies, rice, or your favorite salad! Combine all ingredients listed into a food processor and process until it reaches a creamy, dressing-like consistency. Add milk to your desired consistency. Start with 1/4 cup and increase to 1/3 cup until it reaches the creaminess you prefer. Store in an airtight mason or dressing jar in the refrigerator when not in use. **You are more than welcome to use low-fat or fat-free cream cheese, but I do not recommend it. The fat from the cream cheese really helps to give this sauce/dressing its flavor.